← Long time no Blog…. Here are a few shots of what I am working on this month. I am trying out unstretched canvas and mounting it to my studio wall. I have had rolls of unstretched canvas in my studio for a while now. I bought it with the thought of being able to do custom sizes etc., but since that time I found a man in Texas that will make my canvas in custom sizes for me, so the rolls have been languishing around in my studio for a year or more now. They are huge rolls and I keep moving them from one place to another in order to find other things in my studio. I decided I needed to use them…so here goes with the first one. I have over the last year or more been deeply concerned with the surface quality of my paintings, to the point of really pressing myself to experiment with hues I don’t normally use and tools that might be a bit unorthodox for art making. The journey has led to many hours of working with layers of texture and pigment that has yielded me some pretty interesting pieces in both hue and texture, and I like them and they seem well received. That is the first sign of complacency in art for me, I need to press further, or else I risk the redundancy syndrome. Painting just because it worked last time…I have to keep myself actively engaged or else I might become an automotron turning out paintings that are so similar they become a bit trite. 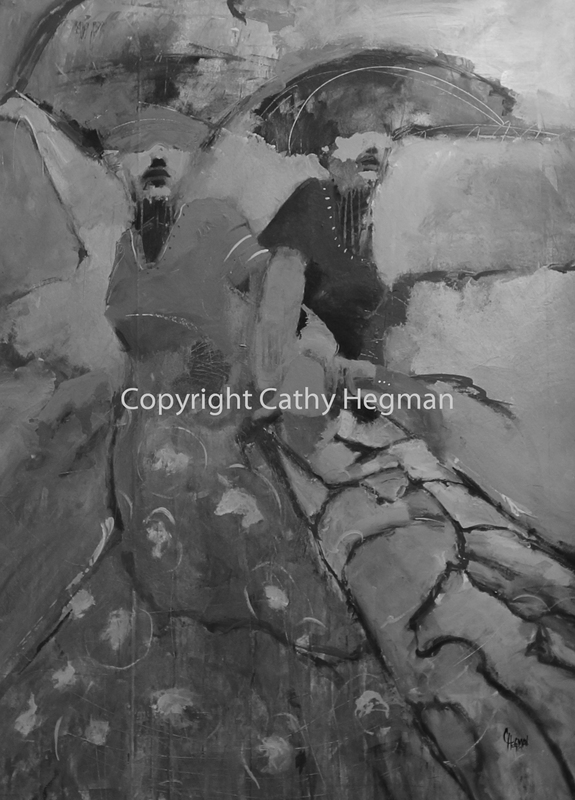 Luckily, I was asked to make larger work for a gallery, which I like to do, but this time, when I thought about the larger work, I wanted my figures to be more evident and a part of, but not melded into their surroundings as they often are in my work. I want them to have a more defined character, that will personify my intent in these coming paintings almost a metamorphosis of a sort for me. I want to do this without making them too definitive, it is a tricky balance to achieve. This first painting, WallFlowers, will be the jumping off point for me. It will let me test myself, to see if this is truly the angle I want to pursue. I will continue my other series throughout the year, but something in my mind is wiggling around, and I am thinking it is time for something a bit newer and maybe different for my figures. Just to keep this in size perspective, I am working on a 72 x 52 inch unstretched canvas mounted on the studio wall. I have not done this in the past, but I have the canvas on hand and I might as well give it a go. I put plastic on the wall first then the canvas…I nailed it across the top and left the side hanging with thumbtacks in them, which I found quickly loose their grip so you might forego that step if you want to do this. I am particularly rough on my surfaces so I substantially nailed my top edge. ( * I am open to,and would welcome, I might add, any advice anyone has on using unstretched canvas for painting). This will keep me loose as I will not feel pressured with this surface, as it has not been stretched and if all fails; then all I have lost is time and paint, but I will have gained new insight for the process. I do like to paint large; but the one thing I have noticed with using the wall, is that I have to have a step ladder to reach the top of the canvas, with stretched canvas I can put it on my easel and raise and lower it accordingly. It is good exercise though, so maybe I should have been doing this all along. I get a workout while I work. Here is the point I have reached so far, I am liking where it is going. Note in the black and white shot you can clearly see I need more dark values in the painting: the lower left is screaming for some dark value and I will attend to that tomorrow! This entry was posted in acrylic, Art right outside my back door. 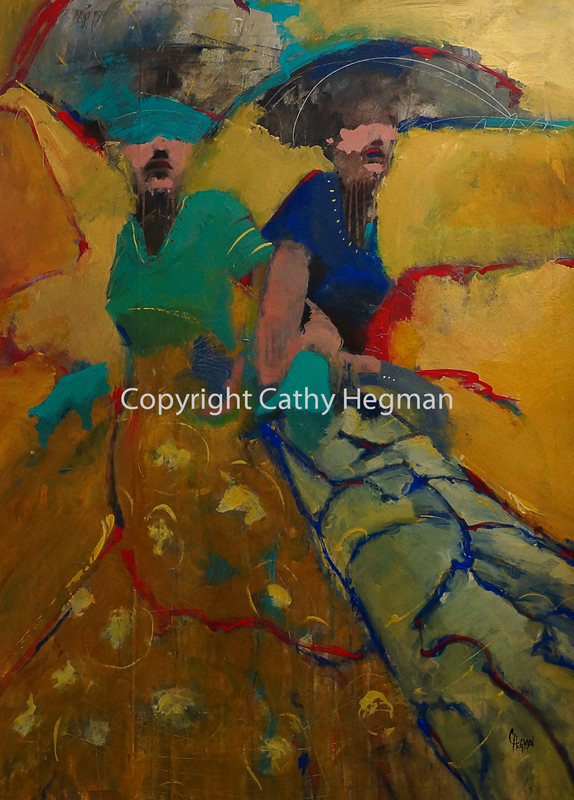 The Big Sunflower River, canvas, cathyhegman, drawing, female, figure, fine art, painting, Uncategorized and tagged acrylic, art, cathy hegman, contemporary, experimental, female, figurative, figurative art, figure, figure painting, figures, fine art, fineart, hegman, hegmanart, instruction, mississippi art colony, mixed media, painting, watercolor, woman. Bookmark the permalink. Good for you, Cathy…. keep on pushing on. I really like this painting….. Thank you Cheryl!!! I appreciate it! Your way would be much easier on the back and legs! Looks great, love what you are doing! I’m thinking of using stretched canvas when I attend the workshop in June. There are many to choose from, any one that you prefer to use? Also, who are you using In Tx to do custom sizes canvas for you? Charlotte, I use Pat at Sunbelt mfg in Longview for my stretched canvases and for cradled wood boards he is great and very economical..Cheryl told me about him…I was using in this case some raw unstretched canvas I had in rolls, I primed it with gesso and flexgel, I will in the future get primed canvas though as that would cut a good bit of work out of this endeavor and you could get right to the good parts of painting.